TradePlumbing evaluate new showers from their suppliers to add to TradePlumbing website. TradePlumbing, one of the UK’s leading bathroom and kitchen plumbing retailers assess the quality of a new shower sample they have received from their suppliers. Showers go through thorough scrutiny at TradePlumbing before being approved for showcase on TradePlumbing website. “Providing our customers with high-quality products is one of TradePlumbing’s top priorities. At the same time, we strive to keep prices as low as possible. Having both high-quality products and affordable prices is consistent with one of TradePlumbing’s core values, which is customer-satisfaction,” commented Murray Wilson, purchasing manager at TradePlumbing.co.uk. The TradePlumbing team analyse the shower components meticulously. There are various criteria based on which TradePlumbing staff decide to accept a product to be showcased on the website or not. 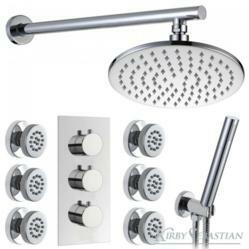 Criteria include elements such as the quality of the shower valves, hose and shower heads. “We really want to make sure that the shower parts meet TradePlumbing standards, which means that showers have to be aesthetically pleasing with a high quality finish, they need to be made from a durable material which is able to stand the test of time and also have the functionality to meet a customer’s needs. The day often starts and ends with a shower. In the morning, people take a shower because they want to be ready to start a new day and in the evening, people take a shower because they want to relieve their bodies of their daily stresses. TradePlumbing help their customers so that they never have to worry about the quality of showers, but rather about other issues such as design or size. Even then, our team of customer service specialists are ready to respond to any questions prospective customers may have,” added Murray Wilson. TradePlumbing.co.uk has been trading online since 2006 and was launched as a result of the emerging eCommerce trend and the owner's family history in the field of running Plumbing and Heating Merchants and Showrooms. TradePlumbing provides its customers with a wide selection of showers and shower accessories and excellent customer service.